Although my notebook of choice (and primary computer) is my MacBook Air, I sometimes prefer something smaller and cheaper to hit the road with… Enter the netbook! I’ve owned (and hacked) several over the years, from the original Asus 701 (Eee) to the Toshiba NB205 (Mini), which I just retired. This time around I wanted something with better performance and a larger screen. Based on my past experience using (and modding) the Acer Aspire One, I decided to purchase a sapphire blue Acer Aspire 1410-2801 with an Intel Celeron SU2300 dual-core CULV processor and an 11.6″ screen. 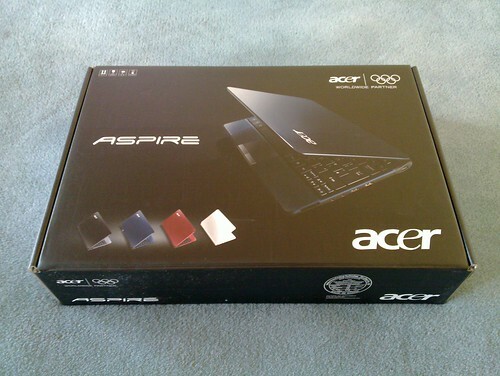 It’s just semantics, but while being thin, light, and affordable, the Aspire 1410 is not marketed as a netbook. That’s fine by me, because I think current netbooks are too big and bloated – 11.6″ screens and full keyboards are great but how about smaller packaging? To me, older netbooks with 9″ screens are still the ideal in terms of system size and weight. I’ll do a post – it’s very simple. I noticed you hadn’t posted anything about installing the bluetooth module on the acer aspire 1410 2801 yet. I was wondering if that post was coming up soon. The connector’s already there – no soldering involved! Not being very tech savvy, I really would have no idea where to begin looking for a netbook. After seeing your post and comparing specs and reviews for some others, I am convinced this is worth paying a little more than rock-bottom prices. I just ordered a similar one, thanks for calling my attention to it. we hope you can start a project to build a wwan in acer 1410.to make a perfect 1410.
you can make it , as you done it in aspire one. Ordered and recieved the same BT module, looking forward to BT module installation as well! When I get some time? tnkgrl, Thank you for your great work on swapping out the SSD for the 1.8″ HD in the Acer One. It worked great the first time. I have a problem, can you help? My Averatec ALL-in-One has a video problem. The video card is an Nvidia P419 VG.8MG06.001. I think this is one of the cards that Nvidia found a problem in manufacturing. Vverated, nor Nvidia, will offer any help. Do you know of a source for these boards, or, better yet, a replacement board? If it’s an all-in-one I doubt the video card is separate – it’s probably part of the motherboard. I don’t want off-topic comments here so please drop me an email (see About page) do discuss this further. Lon are you reachable? I have the same problem, can you email me ? I need to buy a vg.8mg06.001 . I have an acer aspire one MODEL ZG5 and can not figure out how to get it apart and replace the hard drive. Can you help me either with a link or istructions. This is a great timeline model.